Janet Hinds sits with her defense attorney Ben McGowan, left, after appearing before Judge Christie Sell in the Chattanooga-Hamilton County Courts Building on Monday, Feb. 25, 2019, in Chattanooga, Tenn. Hinds is charged with vehicular homicide, among nine total charges, in the hit-and-run death of Chattanooga Police Officer Nicholas Galinger. Judge Sell set Hinds' bond to $300,000. Updated at 8:20 p.m. on Wednesday, Feb. 27, 2019, with information about Hinds' charges. 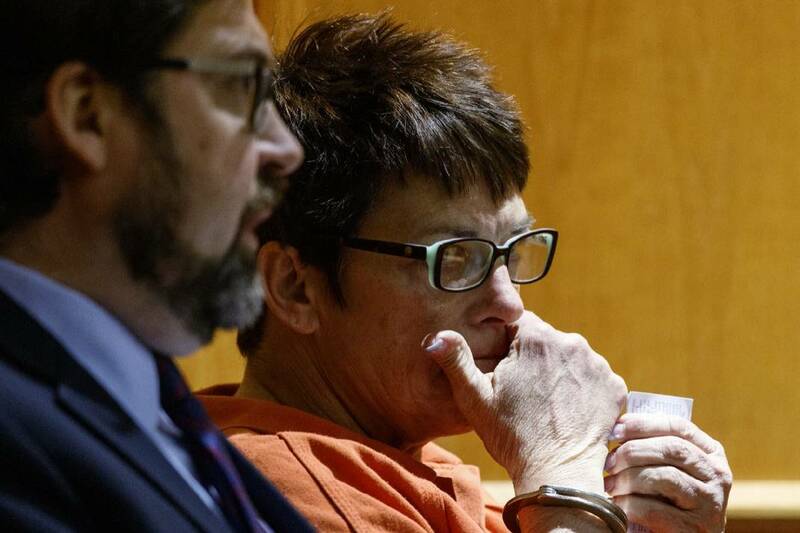 Ahead of a preliminary hearing next week, defense attorneys for the 54-year-old woman charged with hitting and killing a Chattanooga police officer have asked the courts to consider reducing her $300,000 bond to $35,000. Defense attorneys motion to reduce Janet Hinds' bond from $300,000 bond to $35,000. In a six-page motion filed Tuesday that detailed how Janet Hinds turned herself in, attorneys Ben McGowan and Marya Schalk said prosecutors inadvertently portrayed their client as a flight risk by telling a judge that she struck and killed officer Nicholas Galinger on Friday when the fatal incident on Hamill Road happened on Saturday. "Thus, in setting the $300,000 bond [Judge Christie Sell] was left with the false impression that Ms. Hinds delayed reporting all day Saturday, sought legal counsel Sunday and finally turned herself in Monday," the attorneys wrote in the motion. But prosecutors questioned Hinds' cooperation in a response this afternoon and said any bond issues should be taken up during a preliminary hearing Tuesday in Hamilton County General Sessions Court. District Attorney General Neal Pinkston's office declined to comment further when asked about the results of a blood draw for the drugs or alcohol taken from Hinds earlier this week. But a spokeswoman added that Hinds' attorneys agreed not to address the request until after the hearing. The defense attorneys said Hinds needs a "reasonable bond," citing medical concerns that her aortic aneurysm and hypertension would not "be properly monitored" at Silverdale Detention Center, where she is being held. They maintained that Hinds has an excellent community reputation and strong work history and said they expect the proof to show other factors were involved in the fatal incident. "The reality of the death is terrible but the defense expects to show that myriad factors — having nothing to do with Ms. Hinds — were the legal cause of the accident. These include road conditionings, lighting, weather, and inadequate signage, among others," the attorneys wrote. State prosecutors response to motion to reduce Janet Hinds' bond from $300,000 bond to $35,000. In the motion, the attorneys said Hinds contacted the attorneys' office on Sunday shortly after 9 a.m.
"She had just learned that an officer had been hit in the area where she had driven the night before and had reported to a family member that she had collided with a road sign," the motion says. After a meeting Sunday around noon, the attorneys said Hinds agreed to turn herself in Monday morning. The attorneys said they then reached out to District Attorney General Neal Pinkston and coordinated "various search issues and other matters, but at no time was it requested that Ms. Hinds immediately report." In a response, Pinkston suggested Hinds did not really cooperate. He said authorities issued warrants for her arrest on Sunday night and tried to find Hinds but were told by family members that her "whereabouts were unknown." In the motion, Pinkston said Hinds declined to speak with law enforcement about the events surrounding Galinger's death and declined to turn over the keys to her damaged vehicle until she surrendered Monday. He argued the defense offered no proof of other factors that caused the crash and suggested Hinds only turned herself in after she appeared on the Tennessee Bureau of Investigation's top-ten most wanted list Sunday. Ultimately, Pinkston wrote of the defense motion, "these assertions fail to take into account that the defendant never stopped her vehicle" or called 911 after striking something at a high rate of speed. Hinds currently faces charges of vehicular homicide, reckless driving, leaving the scene, failure to report an accident, failure to render aid, violation of traffic control device, speeding, drivers to exercise due care and failure to maintain lane.